Deputy Scott Gaines with bloodhound Lacy, who retired last week. 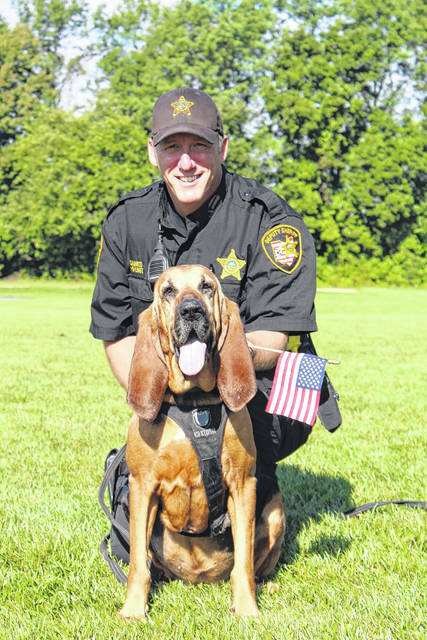 Last week, Delaware County Commissioners approved the sale of the Delaware County Sheriff’s Office recently retired bloodhound, Lacy, to her handler, Deputy Scott Gaines. Gaines said Tuesday that he has been working with Lacy since 2012 and has travelled all over Ohio and to six other states, including Alaska, with Lacy. Gaines added his and Lacy’s main function was locating missing and exploited children, but they also investigated cases where a suspect fled the scene or any other case that involved tracking. Gaines and Lacy appeared before the Delaware County Commissioners on April 19, where the commissioners voted to sell Lacy to Gaines for $1. At the commissioners meeting, Capt. Scott Vance with the Delaware County Sheriff’s Office said Lacy is retiring due to age and a couple of health issues, including heart murmurs and hip problems. “Lacy put in a lot of hard work for us, and Scott has been with her on all of it,” Vance said. Before approving the resolution, commissioners thanked Gaines and Lacy for their service. Commissioner Barb Lewis said she was very happy that Lacy was going to live with Gaines. Commissioner Gary Merrell said he didn’t realize Lacy was so well travelled and said that he hasn’t even been to Alaska. On Tuesday, Gaines said he is working to become a school resource officer and said it seemed like the natural next step after 17 years working as a K9 officer. “My whole career has been about saving and helping kids,” Gaines said. Gaines also expressed his gratitude to the Kody Snodgrass Memorial Foundation for donating Lacy to the sheriff’s office in the first place. More information about the Kody Snodgrass Memorial Foundation can be found at http://www.deputydogs.org/. Gaines added he also had to thank his family for its support over the years and said there was no way he could have done the things he’s done without his family. As for Lacy, Gaines said she has a lot more energy since she retired. “Her plans are basically just be a dog now,” Gaines said.